A possible US intervention into Syria against the background of chaos and bloody turmoil reigning in the country for over two years could become a turning point in the contemporary world history. Everything that is taking place in the Middle East during the Obama’s tenure – be it Tunisia, Libya, Syria or Yemen – is a result of US direct meddling into internal affairs of these countries. At present Obama simply cannot admit that Syria has stood tall against the West and the policy of siding with Islamists has failed. The Assad’s government holds the reigns gaining even more support from Syria people. That’s why the real goal of the planned intervention under the cynical slogan of protecting civilians is rendering support to rebels, who are in the process of suffering defeat. According to Obama’s plans, the mission is to destroy the military infrastructure and enable the rebels with rich experience of fighting unarmed civilians concentrate on regime change. There are no more than 5 percent of Syrian nationals among those who are fighting the government troops; others are mercenaries coming from other countries to fight for money in a foreign land. Some of them come from Russia and other republics of former Soviet Union. The plight of Syrian Christians is especially hard. Terrorists burn temples, attack old men, women and children. Until now the anti-Christian activities of Washington-friendly Islamic radicals have not been contained. It should be noted that some time before the US Congress suspended military and financial support to «Syrian rebels». The main reason behind the decision was the oppression the Syrian Christians are subject to. The major part of Congressmen came to conclusion the US had no moral right to render support to «liberators» involved in atrocities on foreign soil. Unlike the «President – peacemaker» Obama, they believed that such policy leaves the Syrian minorities without any guarantees, while the support of Islamists results in conscientious and purposeful elimination of Christians. The shocking news has started to come from Syria almost daily. For instance, the town of Rableh was surrounded by rebels for a few weeks. Islamists killed everyone trying to leave the area, including the employees of Christian organizations trying to bring in medical supplies and food. It’s impossible to find a single church left undesecrated, foreign mercenaries commit atrocities, bring down crosses and bury them underground. The US administration does its best to exacerbate inter-confessional strife in Syria and across the entire Arab world. It looks like planned destruction of historical areas related to the birth of Christianity… It’s not Syria only. Today the world witnesses the destruction of everything the Christians have created during two thousand years. One of core features of raging Arab Spring is the genocide of Middle East Christians. The Coptic communities appeared in Alexandria in the first century A.D. As Islamists go on a rampage, they pay dearly losing many lives. 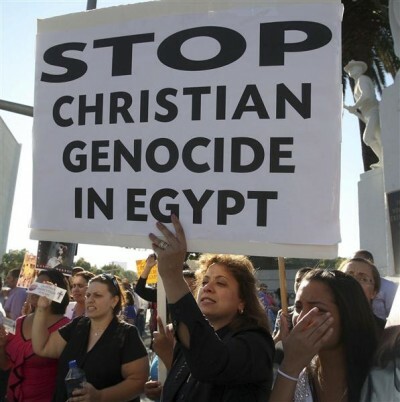 The Egyptian Copts are Orthodox Christians; there had been 10 million of them in Egypt before the US-imposed revolution started. Only during the four days of unrest this August there were 30 Coptic Orthodox temples, 14 Catholic churches and monasteries, 5 Protestant prayer places destroyed and burned in the country. Many thousands of Copts are fleeing Egypt; some of them have gone to Russia escaping the terror. The West have purposefully kept silence about the fact that over 2 million Christians had lived in Iraq till the US 2003 invasion, there are only 300 thousand of them remaining in the country now. It’s hard to find similar instances of such exodus in contemporary history. Is it possible to preserve Christian culture in Arab countries of the Middle East? It’s a serious question. With Washington’s approval the region is moving under the control of Al Qaeda, Jabhat al-Nusra, the Muslim brothers. It won’t be an exaggeration to say that Obama has become a determining factor in the repressions the Middle East Christians are subject to. Let me remember that the condemnation of his predecessor, George Bush, who started the war in Iraq without the congressional approval, was part of the agenda during the Obama’s first election campaign. The promise not to start new wars brought him votes, helped to win the election and become President. Now the words about the need to defend mythical «national interests» in Syria are not taken seriously by Americans, over 60% of them believe an intervention would not meet these interests. The lawmakers want reasonable explanations of the goals and motives in case an operation is launched. In response, Obama promises to take a «personal decision». Looks like Obama is taking a pause in the relationship with his own country as he has done in case of Russia. Most likely he won’t get any approval from Congress as the Constitution envisions. Neither can Washington get approval from the United Nations. Besides, France has deviated from participation in military actions, as well as other NATO allies. And Obama will have to be personally responsible for the fallout in case he decides to intervene. Empty phrases like the promises that the US response to the use of chemical weapons will be limited don’t carry any weight anymore.